I just recently played my first game of Warhammer under the 8th edition. 8th edition isn’t new, I just haven’t been playing any Warhammer in the four years since it came out! 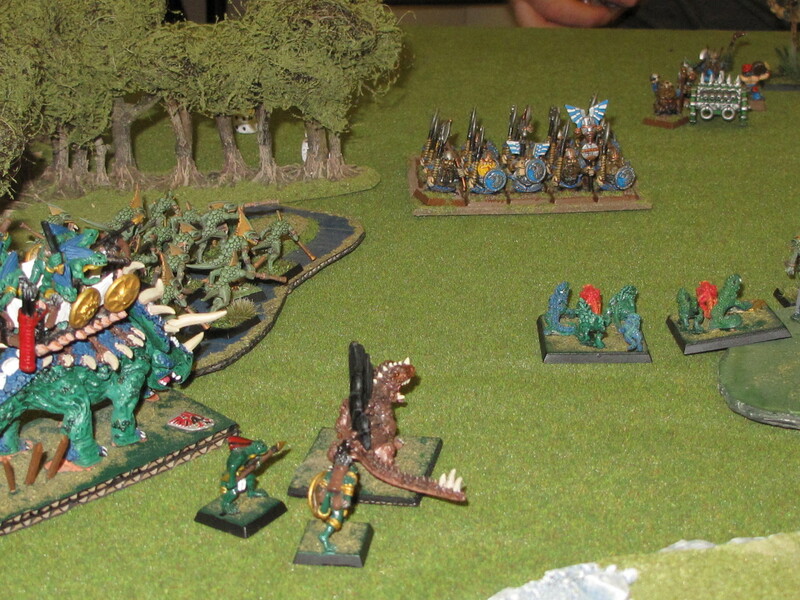 The battle was 2000pts of my lizardmen vs Dave Toone’s dwarves. 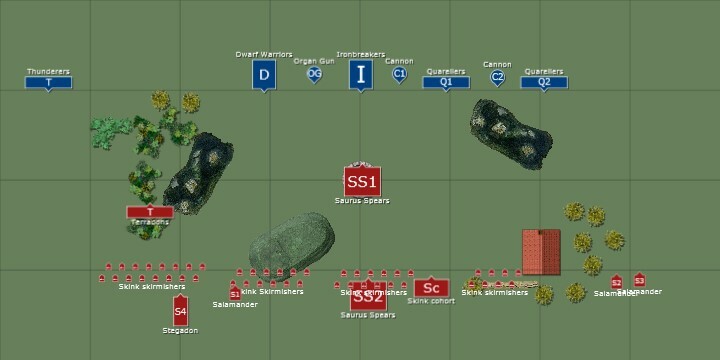 Dave’s army consisted of two decent close combat regiments (warriors with great weapons and Ironbreakers with his general), 3 missile regiments (2x Xbow, 1x handgun), 2 cannons and an organ gun. A Master Engineer and runesmith provided support. I had two regiments of saurus with spears, a stegadon, 3 salamander teams, 2 swarms, a skink cohort with 2 kroxigors and 48 skink skirmishers in units of varying sizes. Saurus lord for general and a saurus hero with the battle standard. Needless to say Dave finished his deployment before I’d put most of my main units on the table, which is why he stuck his Thunderers way out on the flank. They ended up having very little influence on the game, but were presumably there to prevent a high-speed flanking move to hit his arty. Since I had tons of skinks and terradons on that flank I actually had no need to cross open ground on that flank anyway, possibly Dave’s only glaring tactical error of the game. I brought no wizards, always a valid ploy against dwarves. The dwarf player has to hedge their bets and spend points on magic defence, but if you’re playing against them you know you can sink all those points into troops instead and the dwarf player will end up having points wasted on useless runes. Terrain included a swamp and a pond, with the usual scattering of woods, buildings and a hill. When half your army is amphibious always plonk down as many water features as your opponent will let you! Having said that terrain is markedly less obstructive to fire and movement under 8th Ed. Formed regiments can now march at full speed through woods, which is odd, and you can shoot through an entire forest at only -1 to hit, which is just plain silly. This needs fixing IMO, and most people I’ve spoken to seem to agree. 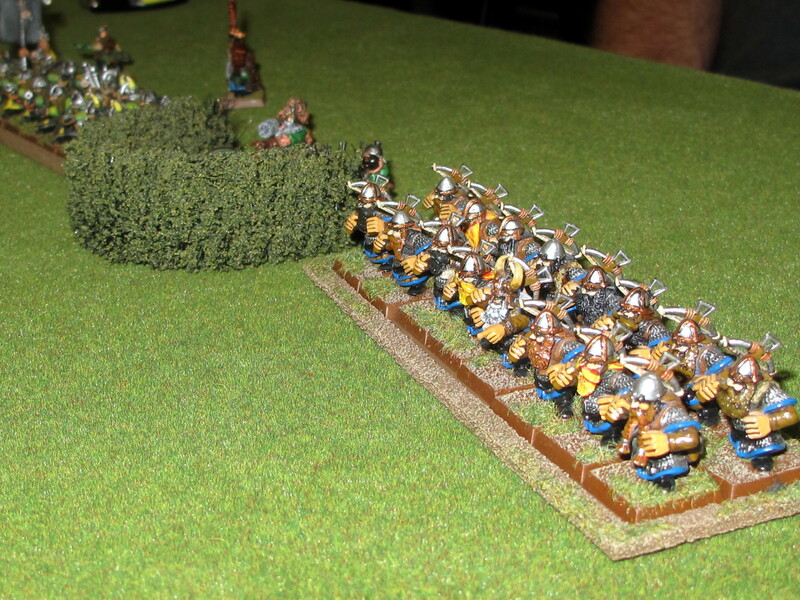 The dwarves were obliged to advance with their close combat troops and try to crack the tower. Their shooting phase was typically effective, killing some defenders in the tower and routing some skinks. The lizardman reply was a general advance, at the usual frightening lizardman pace. Lizardmen fight at bare-knuckle range, even with their missile weapons, so you’ve got to go in hard. 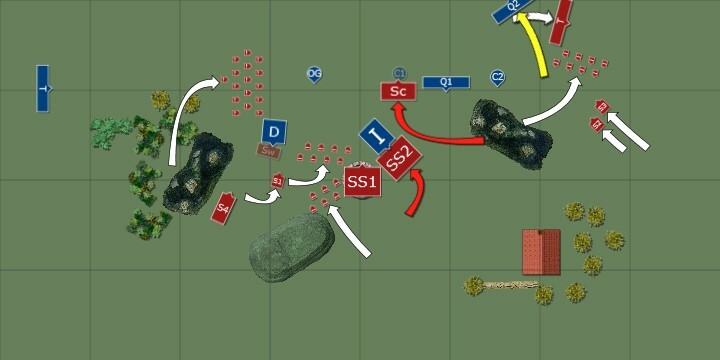 Lizardman turn 1: The Lustrians surge forward to support their lads defending the tower. The dwarf general charged in against the tower, despite killing a few saurus for no loss the defenders refused to budge and the Ironbreakers bounced back an inch. DW turn 2:The dwarf general and his Ironbreakers make their first assault on the tower. Now that their skinks and salamanders were getting close the lizardmen could reply this turn, and causing a few scattered casualties, including some Terradon rocks on the warriors. The warriors had declined to advance to support the attack on the tower, as they were wary of exposing their flank to my stegadon. I left the stegadon parked there, as I was completely happy with this. The Ironbreakers looked like they weren’t going to take the tower quickly, and I had a large saurus regiment advancing to the other side of it, threatening the Ironbreakers’ flank. Saurus coming up on the Ironbreakers’ flank, while a fast-moving skink/kroxigor unit draws the withering fire of the Dorf backline. Check out the Terradons skulking in the stunty deployment zone! The Ironbreakers knocked on the tower door again, but failed to evict the squatters. Dwarf shooting was beginning to tell on some lizard units (the skink cohort especially) the terradons found it particularly unwelcome and flapped off in disgust. 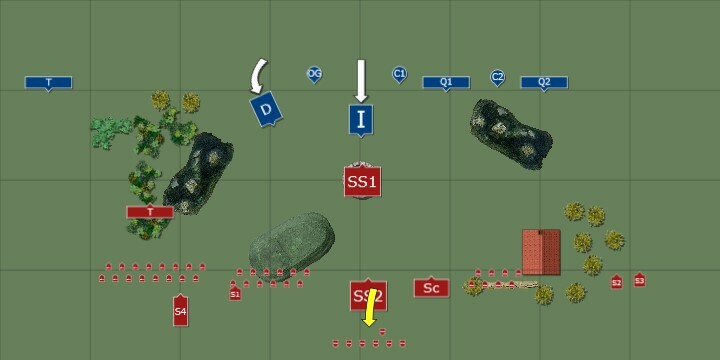 8th Ed flee rules say you continue to flee in a straight line, which luckily kept them on the board in this case. 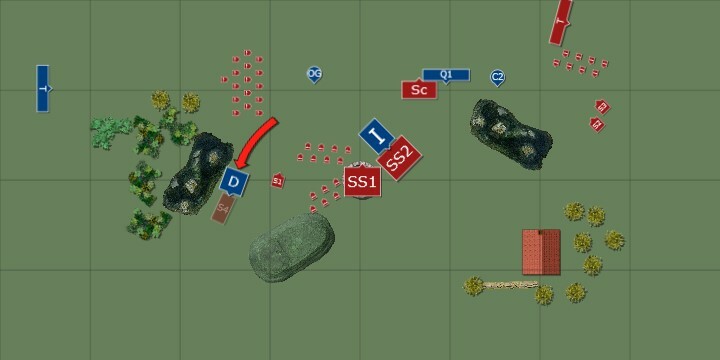 LM turn 3: Two charges (in red) from the lizards this turn. 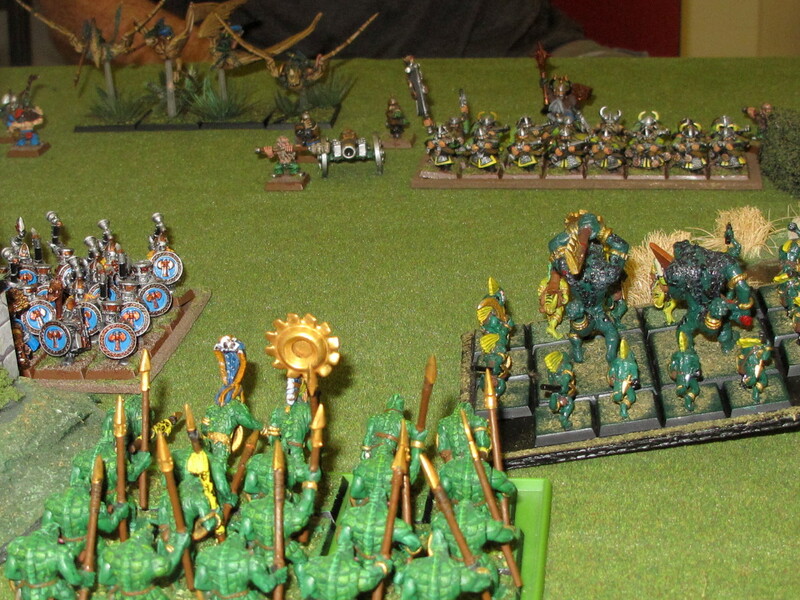 The lizardman response was to charge my second saurus regiment into the Ironbreakers. 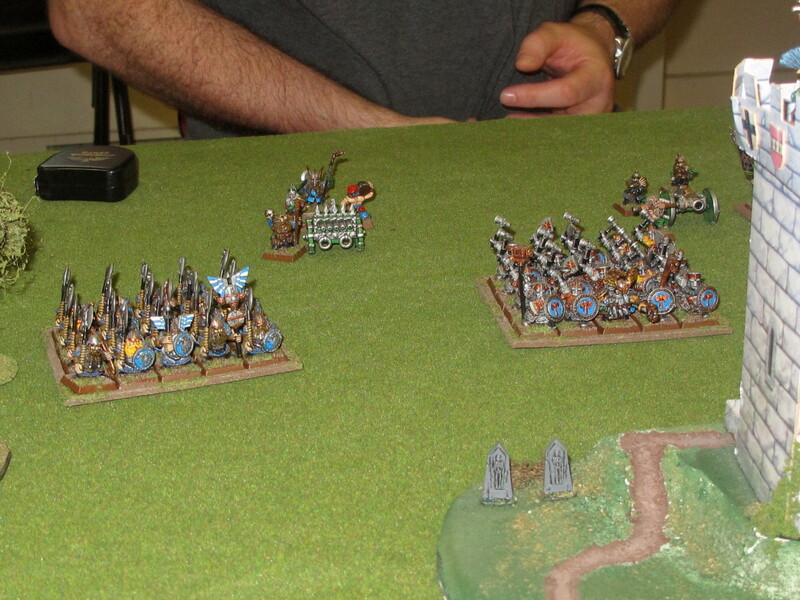 This wasn’t quite a flank charge, so we jockeyed the Ironbreakers to get a frontal contact. The 8th Ed rules are quite sensible about this now, so good work there GW. Saurus and dwarf Ironbreakers seem pretty evenly matched, this combat was going to be a grind. The skink cohort had to get stuck in before it got shot to bits, and charged down a cannon, blitzing the unlucky crew and following up into a clipping contact with the adjacent Quarellers. By now the pair of salamanders on the lizard right were in effective range of the dorfs, and were blanketing their line with fire. The other crossbow unit had enough and promptly fled off the table (double six for flee move, unlucky!) I also decided to throw my small swarm unit in to pin the dwarf warriors with the hope of getting the stegadon into the flank next turn, but the dwarves finished the two swarms off without breaking a sweat. Probably a pointless move on my part. Seeing that the stegadon was now close and without support the dwarves charged in. The new charge distance rules really help the dwarves out, their average charge distance is now 10″, up from 6″ in the past. The steg stomped a few, but got completely obliterated by a frenzy of two-handed axe blows. These warriors had just killed two units in two turns, but were now badly understrength. 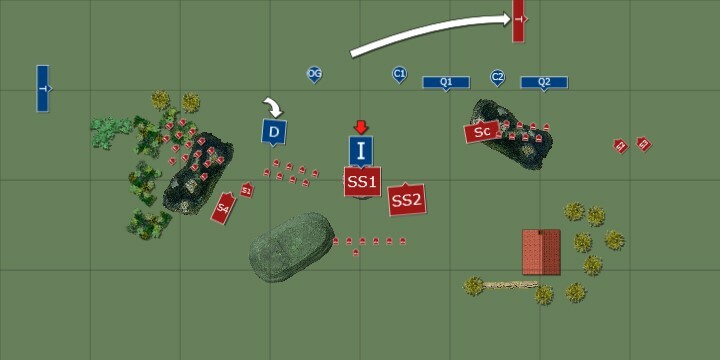 The combat in the centre trundled on, with a few casualties either side. I foolishly had left some skinks in front of the tower that prevented the saurus garrison from hitting the Ironbreakers in the flank. Doh! By now however, dwarf casualties were starting to tell. Moving two units of skinks into point-blank with the warriors I annihilated them in a “bucket of dice” hail of poisoned blowpipe shots. I like to think of skinks as armed with sub machine guns. Get them under 6″ from the target and open up with everything. 8th Ed allows skirmishers to march and fire with the normal -1 penalty, so skinks can potentially start 18″ away and get two shots per model, auto-wounding on a 6 to hit. Against high toughness troops this is amazing. The dwarves really suffer by not having light troops of their own that can clear skirmishers, the only way they can see off skinks is by shooting, which means they’re not shooting at the lizardman heavy units. Bring as many skinks against dwarves as you can, lizard generals! On the dwarf left the Quarellers battled with the skink cohort and managed to drop their last kroxigor, but the other cannon was massively overrun by salamanders and skinks. With some glee Dave announced that the cannon had a boobytrap rune and promptly blew up most of the lizardmen that had slaughtered the crew. C’est la guerre! The organ gun crew also got burned up by salamander fire, and with the Ironbreaker/saurus battle still pretty even it was time to call it a night. The tower was still firmly in cold-blooded hands so it was a lizardman victory! If we’d fought on I would have hit the Ironbreakers in the flank with my second saurus unit, which would have swung the combat somewhat in my direction. It’s possible the dwarves could have out rolled the saurus and come out on top, but the odds were starting to slide the wrong way in an attritional battle. Warhammer has been pretty fun to play since about 6th Ed, and the 8th Ed rules retain most of what makes it work. As mentioned above the terrain and line of sight rules are a bit mental, but the core charge/combat/break/pursue rules work and give a fun game. Fast/flying cavalry are now slightly better, as are skirmishers, which should help keep armies balanced. You’re always going to see one mega-hard unit with tooled up characters in a Warhammer army, but I think it’s really important to keep the light troops effective as this is where a lot of the tactical maneuvering comes from. The least fun army I’ve ever played against was the old-school Bretonnians, as they only had one tactic: full-frontal charge. This gets really boring after a few games. A major change in 8th Ed is the removal of the unit strength mechanic. It’s now not quite so clear what qualifies for negating rank bonuses when charged in the flank, and the bonus for outnumbering is gone, replaced by allowing the unit with the most ranks to effectively become stubborn. I liked unit strength, it made a lot of things very clear, but it was a certain amount of extra admin so I can see why they dropped it to streamline play. Sad to see it go though. The rule allowing large units to be “steadfast” does make large blocks of infantry very solid, which should reduce the impact of heavy cavalry greatly. 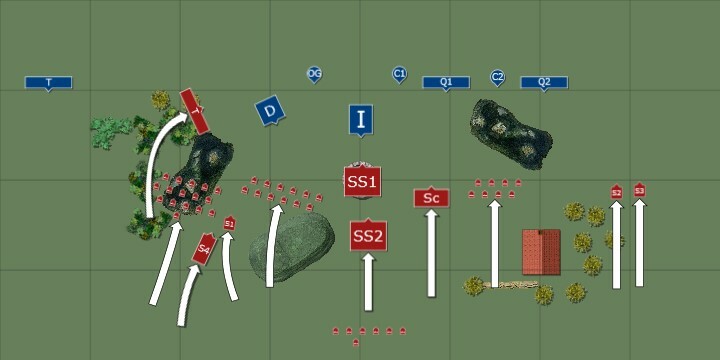 Heavy cav will now be unlikely to rout infantry regiments from any well-disciplined army (or even less-disciplined ones near their general and BSB) on the charge. This should force even tooled up mega-cavalry to coordinate with supporting units, so is a good change IMO. The downside is that infantry combats will often become drawn out grinds, like the Ironbreakers/Saurus combat above. I made numerous small mistakes due to being a bit rusty, but overall the lizardman army seems to still work the way I’m familiar with. Salamanders are still amazing for softening up enemy units in the advance to contact, and I’m chuffed to see the mixed skink/kroxigor unit back! Maneuver aggressively with your skinks and create disruption that your saurus can exploit. Saurus are still very dependable, especially with the general and BSB on the scene. They roll an obscene amount of attack dice. Don’t forget your “Predatory Fighter” rolls, I forgot about these for the whole first half of the game! Dave played well, and is a good sport (and a laugh to play against), the only thing I could fault him for is leaving his Thunderers to dry on the flank as mentioned above. To be honest I think what decided the game was the dice throw for possession of the tower at game start. If Dave had won that and put his Ironbreakers in the tower I don’t think I would have fared any better at taking it than he did. 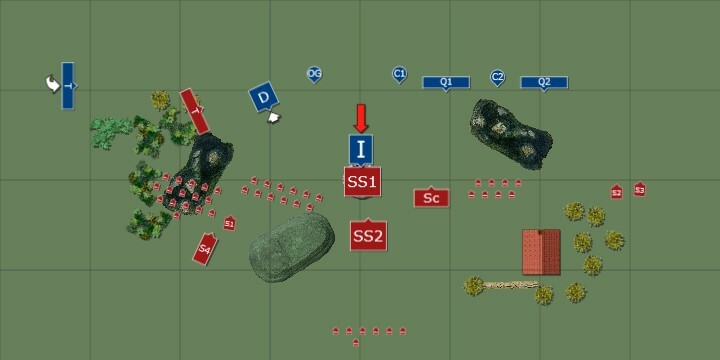 The unique rules for buildings mean the attackers only fight in close combat in their own turn, so attritional close combat is only half as effective. You need to either totally outclass the defenders and break them or you need to seriously thin their numbers. 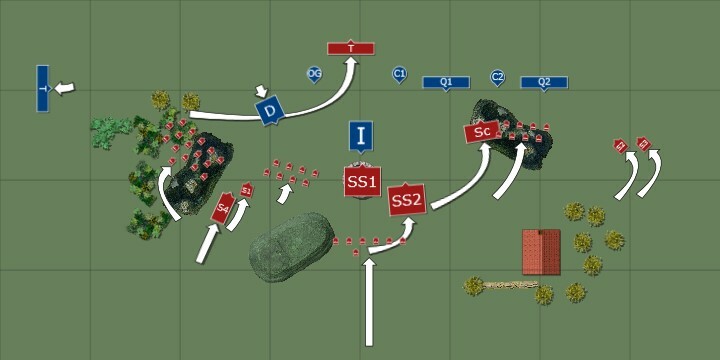 Ideally there should be less than 10 defenders left, so having substantial fire support for building assaults is a must against a competent defence. Flaming attacks are very useful here, the rerolls to wound will go some way to negating the hard cover. Fire throwers like my salamanders are ideal as hard cover doesn’t affect them, each one should cause d6 hits every turn and reroll to wound. Best I could have done if the tables were turned is burn them with all three salamanders for a couple of turns and try to thin them out enough to have my general kick down the door with a saurus assault team. As it turned out the inscrutable Lustrians get to keep possession of that tower for whatever obscure plan the Old Ones had in mind, and the dwarves have to skulk back and scribble another entry into their Book of Grudges. Just how I like it!